Have you heard the story of the Old Main fires? Instead of the large campus we have now, the university (then the Iowa Agricultural College and Model Farm) was housed entirely in a single building, “Old Main.” Old Main stood where Beardshear is now. Old Main proved to be much less sturdy than Beardshear – it lasted only 34 years. First it was damaged by a tornado (1882), followed by a fire (1900) that destroyed the north wing and caused extensive damage to the rest of the building. Two years later a fire ravaged the remainder of the structure and Old Main was completely destroyed (1902). But, students turned this tragedy into an opportunity for a new tradition. The image above depicts Class President of 1933, Arloe Paul, presenting Class President of 1958, Jerry Ladman, with a metal ram’s head. The head is purported to be architectural salvage from one of the fires in Old Main. The story is that it was rescued by Dean Edgar Stanton and O. H. Cessna (both class of 1872). The passage of the head every 25 years has become a campus tradition that continues to this day. It is next due to be passed from the class of 2008 to the class of 2033. Of course, you’re always welcome to stop by and see us or get in touch! It’s finally here: VEISHEA! And soon those treats most synonymous with the celebration will be available – cherry pies. 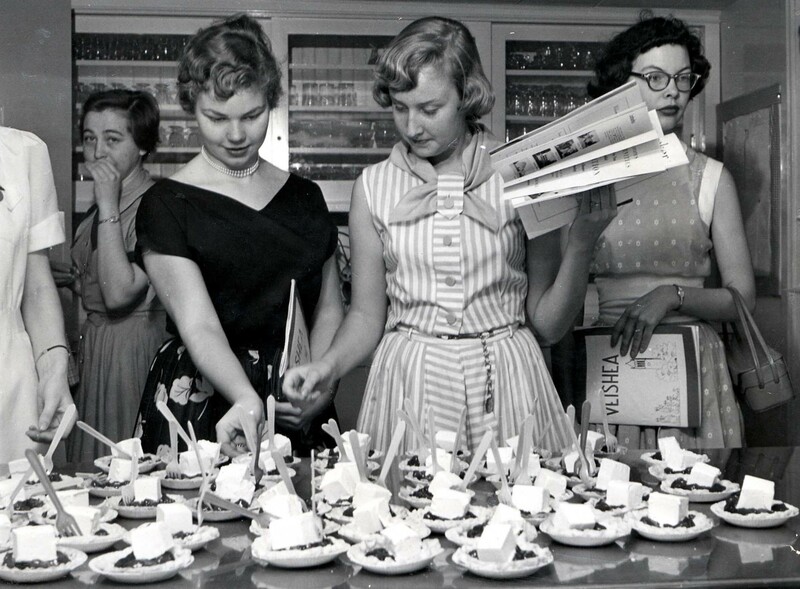 In fact, the cherry pies are a tradition that came about even before VEISHEA in the early 1920s.Started by the Division of Home Economics, the cherry pie sale is now run by the Department of Apparel, Events, and Hospitality Management (formerly Hotel, Restaurant, and Institution Management). Originally, they were sold in February to celebrate George Washington’s birthday. Today, they are a staple of our annual college celebration. More information on these delectable desserts can be found here. The acronym, VEISHEA, stands for Veterinary Medicine, Engineering, Industrial Science, Home Economics, and Agriculture, all of which were the divisions that were in existence in 1922 when VEISHEA began. Iowa State College (University) didn’t become a university until 1959, so until that time it consisted of “divisions” rather than “colleges.” Today, VEISHEA continues to be a celebration of each of the colleges and the university as a whole. For more information on VEISHEA and cherry pies, see this online exhibit, our digital collection, or come and look through through any one of our VEISHEA collections! Be sure to check out more photos of VEISHEA (including more involving cherry pies) here. Also, we’ve had several blog posts on the subject over the last couple of years, so read on! Have a fun (and safe) VEISHEA, everyone! 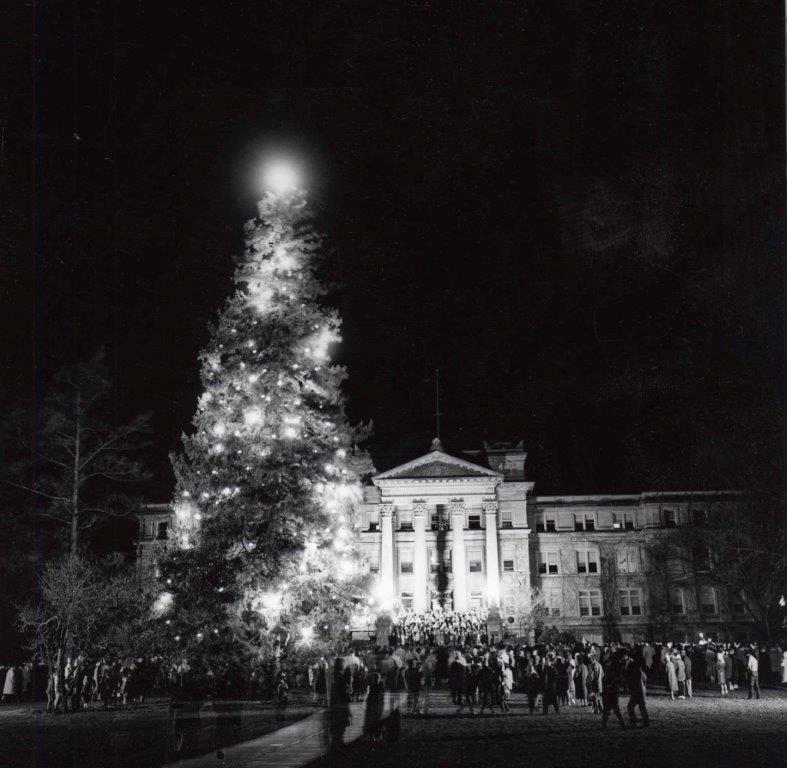 Christmas tree lighting ceremony on central campus, undated. With the holiday season upon us and winter break officially starting next week for the students, it seems fitting to highlight a photo of a long-standing holiday tradition here at Iowa State. The tree-lighting ceremony originated in 1914, but was discontinued only to be started up again in 1946. As part of ISU’s annual WinterFest celebration, people gather around the evergreen tree across from Beardshear Hall on central campus to listen to the carillon, hear a speech from the president, sing Christmas carols, and to watch the tree light up. This year’s celebration was December 6th and was held inside Beardshear due to the frigid temperatures. 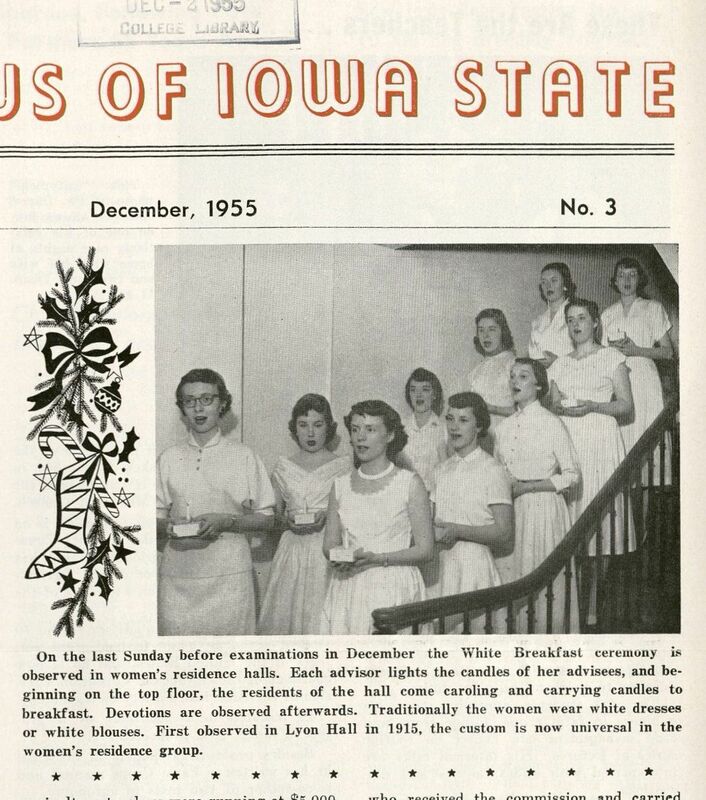 For more information on this and other ISU traditions, see the Iowa State University Traditions, Songs, and Cheers Collection, RS 00/16/1. However, wherever, and whatever you celebrate, have a wonderful holiday and happy new year!